GAA Classic Cars Auction in Greensboro, North Carolina offers 550 rare and vintage vehicles three times a year at its facility in Greensboro (known as “the Palace”) plus online. The firm’s July 27-29 auction will feature a great selection of quality MOPAR vehicles, ’55-’57 Chevys, and some fantastic Corvettes and Camaros. 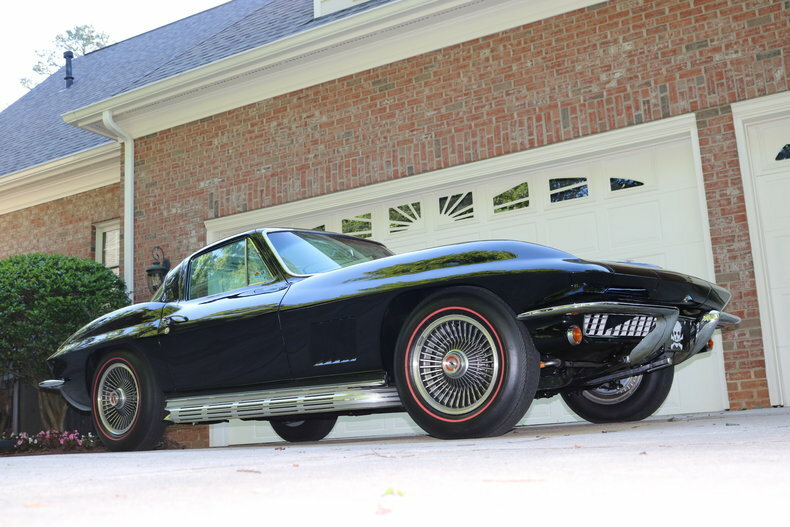 One of those Corvettes is pictured here: a 1967 coupe, believed to be one-of-one and affectionately called “The Skunk” because of its black exterior and white leather interior. The four-speed manual ‘Vette, with a 427 c.i./400 hp matching numbers engine, is expected to bring $200,000-$250,000. Two other vehicles will also spark fierce bidding wars. One is a 1958 Series 62 Cadillac convertible, white with blue interior and in absolute like-new showroom condition. No expense was spared in the restoration of the car, which has taken first place honors at multiple shows and has an estimate of $185,000-$210,000. The other is a true one-off vehicle – a two-door 1948 Mercury Templeton Saturn coupe, blue with blue and white exterior (est. $225,000-$275,000). The custom-built car is built on a ’39 Ford chassis, and has a ’36 Chrysler elongated hood, ’49 Chevy rear fenders, a ’48 Dodge grille and a Nash hood ornament. Benjamin Franklin Austrian (1870-1921) was an American painter with an odd calling card – chickens. “I paint chickens because I love them,” he once said, and the largely self-taught artist from Reading, Pennsylvania was so successful as a poultry painter his devoted admirers stretched around the world. 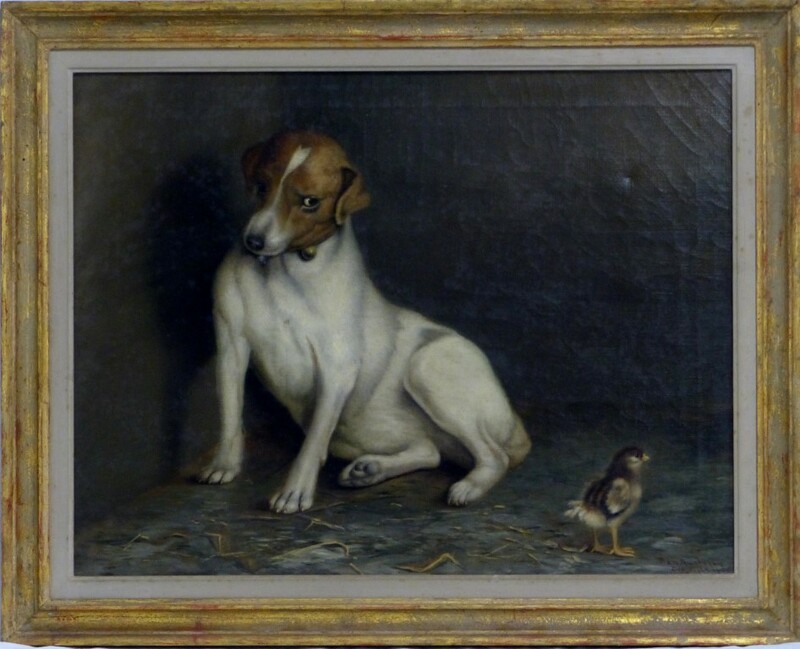 One of his paintings, depicting a Jack Russell terrier dog casting a downward glance at a baby chick, will be sold in Antiques & Modern Auction Gallery’s next auction, on Saturday, July 29th, online and at its gallery in West Palm Beach, Florida. The work, titled Shame on You, has a pre-sale estimate of $8,000-$12,000. Austrian worked for a while at his family’s dry goods and steam-cleaning businesses as a young man, but artistry was always tugging at him and he eventually became a full-time painter. He really did love chickens – assembling his own flock and teaching them to pose so he could paint them from life. He raised his own hens from birth so they would bond with him. He even gave his poultry models names, such as Coal Black Lady, Dame Julia and Dame Pauline. Later in life, he became a tonalist painter, producing misty renditions of the Berks County (Pa.) area, as well as Florida landscapes. He had residences in both states. One of the more visually beautiful lots in Holabird Western Americana Collections, LLC’s upcoming August 6th Western Americana Auction in Reno, Nevada is the silver parade saddle with matching parade-style headstall and breast collar you see here, made around the 1930s by the Keyston Brothers of San Francisco. The saddle features silver work by Schaezlein, one of the finest silver men in San Francisco for saddlery. 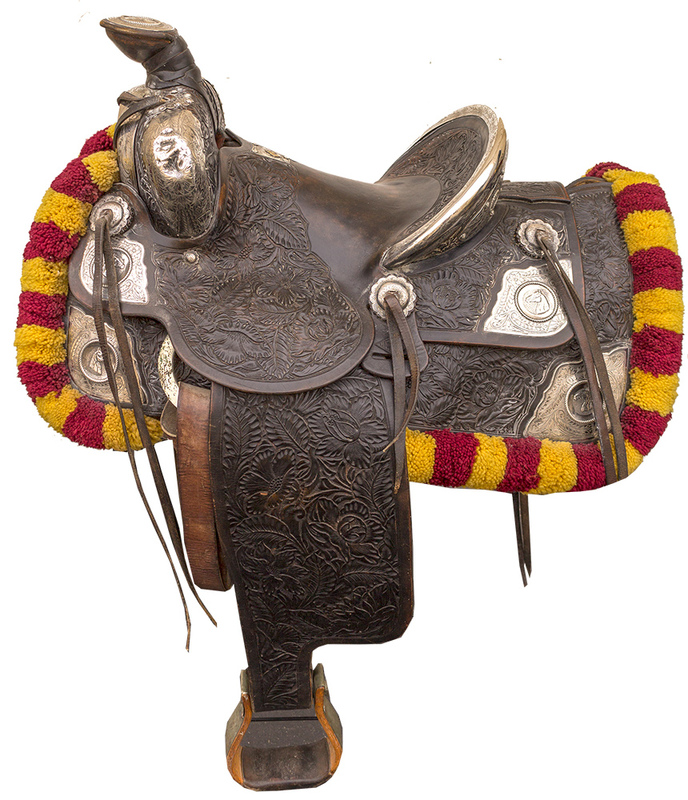 The silver ornamentation adorns the saddle all over that contains horsehead with rope border, which resembles a medallion. The saddle is lot #1040a in the sale and has an estimate of $3,500-$7,000. The auction overall will feature 370 lots – everything needed to outfit one’s cowboy dreams: saddles, guns, Native American art and artifacts, kachina dolls, Western art, Native American jewelry and clothing and more, at price points for the novice as well as the advanced collector. Some items pertain to Pawnee Bill (1860-1942, born Gordon William Lillie), the American showman and performer who specialized in Wild West shows, along his wife, May, the show’s star as a sharpshooter. Items will include May’s octagon barrel single shot .22 caliber rifle and Bill’s wooden travel trunk and his Winchester model 94 rifle. The alleged mistreatment of elephants in circuses and zoos, as well as the shutting down altogether of Ringling Brothers and Barnum & Bailey Circus, were both in the news this year, so it makes the painting you see here an historical curiosity as much as a collectible. It’s one of a small selection of circus-themed works in John Moran Auctioneers’ August 8th Studio Fine Art Auction, online and at the firm’s gallery in Monrovia, California. 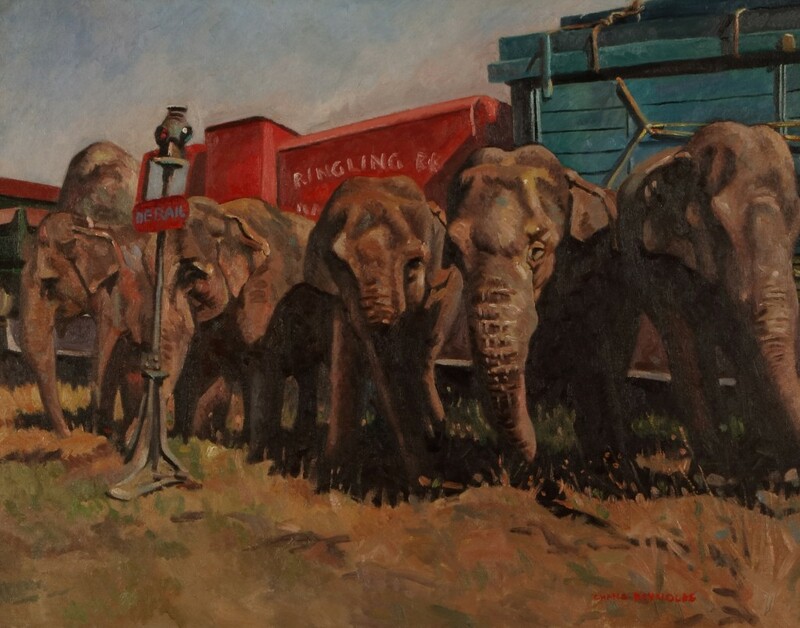 The charming oil painting of a row of circus elephants standing before Ringling Brothers circus train cars was done by Chang Reynolds (Calif., 1914-1987) and has an estimate of $1,000-$1,500. Also up for bid that day will be an oil painting by Hans Zimmer (Calif., 1910-1996) of a steam-powered locomotive before a massive factory in California (est. $2,000-$3,000); a modern oil painting by Gaston Bogaert (Belg., 1918-2008), titled Sous Les Halles (est. $1,500-$2,500); an oil painting by Louis le Poittevin de la Cruise (Fr., 1847-1909), of beached sailing ships just after a rainstorm (est. $1,000-$2,000); a vibrant watercolor by Robert Wyland (Calif., b. 1956) of a blue whale (est. $1,000-$2,000); and a work by noted fantasy illustrator Frank Frazetta (Fla., 1928-2010), titled Golden Girl, expected to hammer for $400-$800.